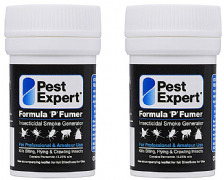 PLEASE SEE THE NEW MAXIMUM STRENGTH REPLACEMENT FORMULA P COCKROACH FOGGER BELOW. The Insecto Cockroach Destroyer Bomb is an automatic release aerosolthat once set off will clear a room of all cockroaches it comes incontact with, including cockroaches hiding in hard to reach places such as cracks and crevices. This product has a specially designed nozzle, which can be turned off mid-spray making it ideal for multiple treatments. Most insects hide away from view and are difficult to control with hand sprays. However once the Insecto Cockroach Destroyer Bomb has been released it will penetrate all ‘nooks and crannies’ and kill all the insects in sight and those out of sight. This product is an innovative solution for the toughest pest problems and is one of our best selling products into the professional UK pest control market. Contains the active ingredient Permethrin 0.50% w/w. Ensure all living organisms are out of the room i.e. people, plants, pets etc. Cover all water storage tanks. Remove all food and drink. Do not contaminate foodstuffs, eating utensils or food contact surfaces. Close all windows, doors and ventilation of the premises before starting the treatment - for indoor use only. Put the aerosol onto the floor, in the middle of the area to begin treatment. Push and twist the trigger to activate and leave the premise. Aerosol will emit mist for approximately 2.5 minutes until empty. Leave the treated room for 90 - 120 minutes. When you re-enter the room fully aerate the room and ensure there is adequate ventilation. Please note that if there are areas in which the smoke cannot penetrate, these need to be treated with sprays and/or powders. In cases of heavy infestations these bombs should be used as part of a multi-pronged attack. Users must comply in full with all their legal responsibilities under the control of pesticides regulations 1986 (as amended) including complying with all conditions of approval.